Hot Stamping Foil Cutting machine. Under the strict guidance of seasoned professionals, we are manufacturing trading & supplying an exclusive range of Foil Cutter . The offered Foil Cutter are expansively demanded for their alluring designs, smooth finish and elegant looks. - Simple and rugged construction. - Easy loading & removal of the roll. - Cutting thin slice is possible. - Fully enclosed drive unit for safety. We are into manufacturing wide range of PVC & House Foil Cutters. 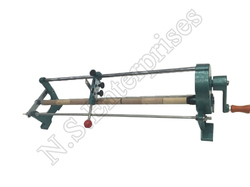 Size: PVC, Slot type Alloy, Metal cutter & Rewinding works for metal cutter. Very practical cutter for plastic foil and masking paper with magnet on back. The special design of this cutter guarantees that cutting is simple, safe and prevents damage to the vehicle.